Project team includes Collaborative Cos. and Cranshaw Const. 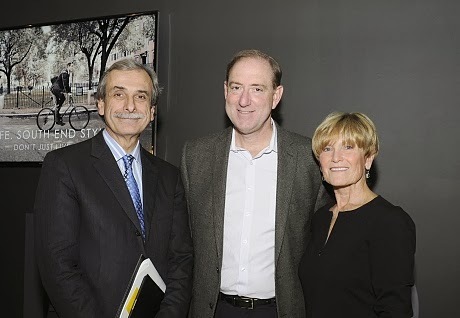 Shown (from left) are: David Manfredi, founding principal at Elkus Manfredi, Ted Tye, managing partner of National Development and Sue Hawkes, president and CEO of The Collaborative Companies. National Development said its development plans for SEPIA at Ink Block, 83 condominiums that will be built as part of INK BLOCK South End. Responding to increased demand and interest in a type of housing that has been in limited supply, SEPIA at Ink Block represents the sole condominium development planned for new construction throughout the city. The Ink Block community will encompass six buildings on a full city block and consist of a flagship Whole Foods, additional shops and restaurants, parking and amenities. A sales center opened at 401 Harrison Ave., and construction is planned to begin in early 2014. The SEPIA condos are slated to be complete and open for occupancy in mid-2015. Cranshaw Construction is the general contractor and Elkus Manfredi Architects is the architect for SEPIA. The Collaborative Companies will serve as the marketing and sales agency. "We are very excited to begin work on our fourth building at Ink Block and to offer a luxury condominium product in this hot new location," said Ted Tye, managing partner, National Development. "SEPIA is the only new luxury condo project planned for new construction in the Boston market, and it will provide residences that fit in with the character and style of the South End." "Between the convenient location and luxury amenities, the condos at SEPIA are truly a unique product in Boston," said Sue Hawkes, president and CEO of The Collaborative Companies. "Residents can expect a lifestyle that has the best of city-living, as well as a community feel that National Development is creating here at Ink Block by making it the new center of gravity for life in the South End." Located on the former site of the Boston Herald building, Ink Block South End will serve as a new hub for life South End style and feature a total of 475 units of housing, including the 83 condominiums at SEPIA, and 85,000 s/f of retail space. 1 INK, 2 INK and 3 INK will offer one, two and three-bedroom rental apartments located above retail space and underground parking. National Development recently acquired the former FW Webb property at 237 Albany St. to further expand the Ink Block footprint. Like the neighborhood itself, SEPIA is design-driven with character and style. The amenities - underground resident parking, a rooftop sundeck, private balconies, access to Ink Block's rooftop pool, fitness center, clubroom, bicycle workshop, and a 50,000 s/f Whole Foods Market nearby- make it Boston's most exciting new home ownership development. Residents of SEPIA at Ink Block will also have the opportunity to make their own mark by customizing the finishes of the condos to match their personal tastes and preferences. SEPIA is positioned in the South End, which is known for its walkable streets, locally-owned shopping boutiques, live music, dog parks and more. In addition, the development is located right off I-90 and I-93, just minutes from Logan International Airport, and within a walk of the Back Bay, the Financial District, major medical centers and South Station. Located at the corner of Harrison and Traveler Sts., the INK BLOCK community will further enliven the streetscape with other restaurants and retail shops, becoming Boston's newest destination for 18-hour living. The flagship 50,000 s/f Whole Foods Market, which will be the chain's largest location in Boston and the first-ever full-size grocery store in the South End, is slated to open in early 2015 and will include outdoor sidewalk café seating along Harrison Ave., as well as extensive prepared, natural and organic foods.